Canadian astronaut Bob Thirsk floats aboard the International Space Station with a copy of Victoria author Chris Gainor's book, "Arrows to the Moon." BELOW: Chris Gainor. As a boy, Chris Gainor arose at dawn to watch the launch of an Atlas missile atop which rode the astronaut John Glenn. He followed the Gemini program and by the time Apollo took men to the moon, he was hooked, dreaming of the future day when he, too, might go into space. Of course it never happened. Gainor became a journalist, winning a National Newspaper Award with the Vancouver Sun, later working as a communications director for the NDP caucus in Victoria. Every January, he dons a trench coat and jams a long cigar into his mouth as he impersonates Winston Churchill at a ceremony in Beacon Hill Park to honour the memory of the British prime minister. In recent years, he has returned to university as a lecturer and post-graduate student. He is now at work on a doctoral thesis. Along the way, he wrote books about his favourite subject. He has had four published. The first of these was “Arrows to the Moon,” which tells the story of Canadian engineers who contributed to the American space program from its earliest days. Their work has gone unheralded. 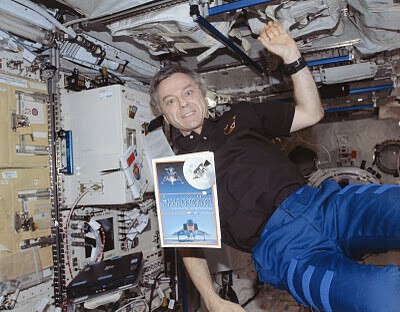 One fan of the book is Dr. Bob Thirsk, the astronaut born in New Westminster. Dr. Thirsk, a mechanical engineer and medical doctor who is invariably described as being a down-to-earth fellow, thinks today’s astronauts follow a Canadian tradition of exploration blazed by the likes of David Thompson. Last year, the astronaut asked Mr. Gainor for a copy of his first book. The Victoria author dutifully signed a copy, which he suspected was a donation for charity. The author and the astronaut got together again on Thursday when Dr. Thirsk and Belgian astronaut Frank De Winne spoke to students at the Nanaimo District Museum. The astronaut had a surprise for the author. Dr. Thirsk presented him a photograph of the book floating aboard the International Space Station as it whizzed around the earth in orbit, an image snapped during his six-month stint in space last year. He also gave him a certificate attesting to the book’s journey. When Mr. Gainor opened the book, he saw his own signature had been joined by those of 13 others, including a Russian cosmonaut. A crew member had also pressed a rubber stamp certifying the book had been aboard the space station. Meanwhile, he’s completing his thesis. The subject — the history of the Atlas missile which so long ago sparked his interest in outer space. Manabu Doi, 81, returned to the place of his birth earlier this month for the unveiling of a plaque. His hometown was once known as No. 1 Mine Japanese Town, a hamlet outside Cumberland, where the first immigrant miners had settled in 1893. His father worked in the mines and the forests, raising a family in tough Depression days. The son remembers sharing the bounty of the area’s fruit trees with local families, while firewood was presented to widows who had lost their husbands to industrial accidents. His own childhood memories are of a bucolic time. He was a Grade 7 student when the radio and newspaper delivered the news about the Japanese attack on Pearl Harbor. He had celebrated his 13th birthday just two days earlier. In a few short months, his father, Denjiro, and his mother, Fusayo, were ordered by the government to pack their belongings and leave with their three surviving children. They were evacuated from nearby Union Bay before being sent to a camp at Lemon Creek in the Slocan Valley. One day, the children were playing on the frozen river when little Johnny Ito fell through. It is said manabu rescued the boy by using his hockey stick. At war’s end, the Canadian government ordered the Doi family to transfer to Eastern Canada or to move to Japan. His parents chose their homeland, a terrible decision in the son’s opinion. They returned to their native prefecture, whose capital city, Hiroshima, had been destroyed a ear earlier by an atomic bomb. Their village wassix kilometres from Ground Zero. Manabu Doi worked as an interpreter for the occupying forces, before returning to Canada in 1957. He settled in Toronto working for an import-export company. Any time he found himself in British Columbia, he made a pilgrimage to the old townsite on Vancouver Island. Only a single house remains. Last fall, 31 decorative Mount Fuji cherry trees were planted on the site, one for each family ordered away. Nine days ago, a brass plaque marking the town site was unveiled. Mr. Doi, who lives in Toronto, was one of at least two former residents in attendance. The ceremony was attended by local politicians, the RCMP, the military, and the Japanese consul general. Work is also being done to repair the Cumberland Japanese Cemetery in which rests 198 dead. Among them is Mr. Doi’s baby brother Ikuo, who died in infancy, the only member of the family never to have left No. 1 Mine Japanese Town.